Permethrin, a synthetic pyrethroid derivative. - Thoroughly wash and dry the skin with clean cloth. - Apply the cream into the skin from the neck to the soles of the feet, special attention to the web spaces, flexures, wrist and thigh. - Leave the permethrin cream on the body for 8 to 12 hours. - Wash off by taking a bath. - Gamma benzene hexachloride lotion is to be applied all over the body except face, after scrubbed bath and kept it for 12 to 24 hours. Apply for two consecutive days and repeat after 10 days. While taking bath whole body should be scrubbed to open up the burrows. - Overnight application of 25 % emulsion lotion for three consecutive nights. - An application of thin layer of 10% cream or lotion from neck to toes. - Crotamition and hydrocrtisone combination is an effective treatment for nodular Scabies especially over the genitalia. -Sulfur ointment with 6% precipitated sulfur applied to the entire body at night for three consecutive nights. - 12 milligrams (mg) single dose of tablet ivermectin to be repeated after 15 days. - Repeat dose of ivermectin after two weeks improves cure rate. -Secondary Bacterial infection with Eczematization and paraphimosis are treated before antiscabetic applications. -Secondary infections are treated with oral erythromycin or cefadroxyl or cloxacillin . -Antihistaminics like pheniramine maleate or levocetrizine are useful to relieve pruritus (Itching). 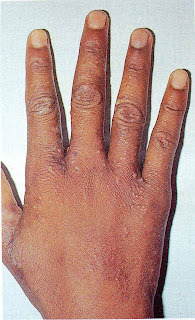 Erythematous or skin colored persistent papules and nodules occur over genitalia, axillae especially in the male . Extremely pruritic lesions. These skin lesions can not demonstrate mite or mite products. Atypical rare form of Scabies that affects immunosuppressed persons (HIV infection and immuno suppressive therapy ) or those who have lost the sensation of pruritus, mentally retarded persons who are unable to take care of themselves. Scaly erythematous and keratotic plaques over extremities, trunk, scalp and faces are characteristics of this condition. This type of Scabies is likely to be missed without a high index of suspicion. This type is usually present in individuals with good personal hygiene. 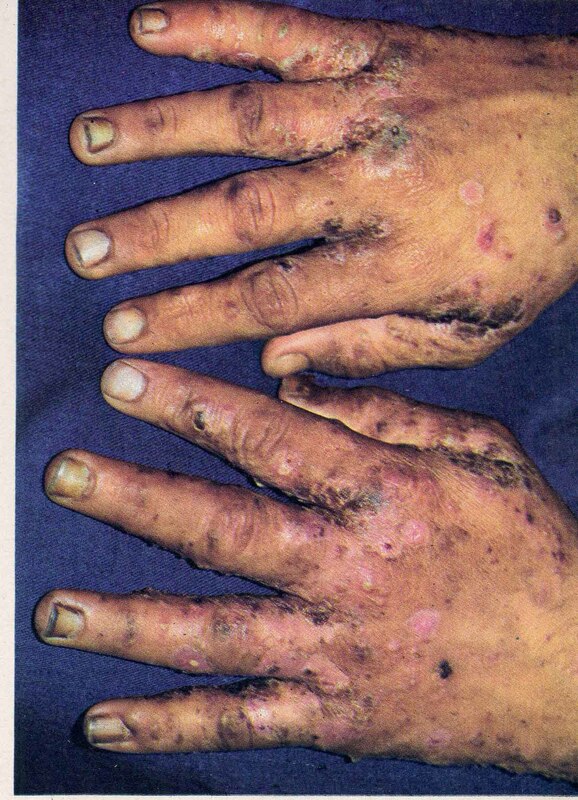 These patients have fewer lesions, but sever pruritus. Lesions may be at atypical sites. This type of Scabies shows involvement of palms and soles as well as the face and scalp.